(A) All final rejections setting a 3-month shortened statutory period (SSP) for reply should contain one of form paragraphs 7.39, 7.40, 7.40.01, 7.40.02.fti, 7.40.02.aia, 7.41, 7.41.03, 7.42.03.fti, 7.42.031.fti, or 7.42.09 advising applicant that if the first reply is filed within 2 months of the date of the final Office action, the shortened statutory period will expire at 3 months from the date of the final rejection or on the date the advisory action is mailed, whichever is later. Thus, a variable reply period will be established. If the last day of "2 months of the date of the final Office action" falls on Saturday, Sunday, or a federal holiday within the District of Columbia, and a reply is filed on the next succeeding day which is not a Saturday, Sunday, or a federal holiday, pursuant to 37 CFR 1.7(a), the reply is deemed to have been filed within the 2 months period and the shortened statutory period will expire at 3 months from the date of the final rejection or on the mailing date of the advisory action, whichever is later (see MPEP § 710.05). In no event can the statutory period for reply expire later than 6 months from the mailing date of the final rejection. (B) This procedure of setting a variable reply period in the final rejection dependent on when applicant files a first reply to a final Office action does not apply to situations where a SSP less than 3 months is set, e.g., reissue litigation applications (1-month SSP) or any reexamination proceeding. (3) does not place the application in condition for allowance — then the advisory action should inform applicant that the SSP for reply expires 3 months from the date of the final rejection or as of the mailing date of the advisory action, whichever is later, by checking box 1.b) at the top portion of the Advisory Action form, PTOL-303. 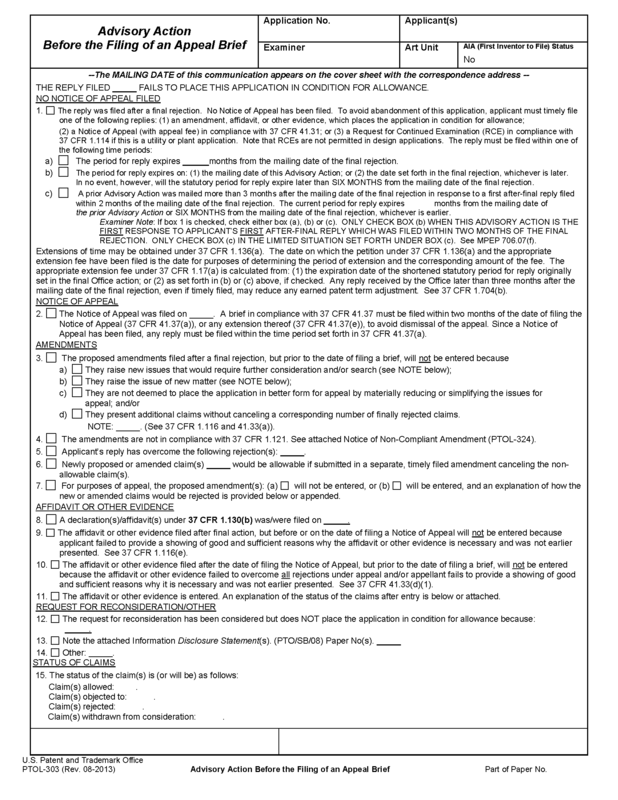 (D) Where the final Office action sets a variable reply period as set forth in paragraph (A) above, and applicant does NOT file a complete first reply to the final Office action within 2 months, examiners should check box 1.a) at the top portion of the Advisory Action form, PTOL-303. (E) When box 1.b) at the top portion of the Advisory Action form, PTOL-303 is checked, the time for applicant to take further action (including the calculation of extension fees under 37 CFR 1.136(a) ) begins to run 3 months from the date of the final rejection, or from the date of the advisory action, whichever is later. Extension fees cannot be prorated for portions of a month. In no event can the statutory period for reply expire later than 6 months from the date of the final rejection. For example, if applicant initially replies within 2 months from the date of mailing of a final rejection and the examiner mails an advisory action before the end of 3 months from the date of mailing of the final rejection, the shortened statutory period will expire at the end of 3 months from the date of mailing of the final rejection. In such case, if a petition for extension of time is granted, the due date for a reply is computed from the date stamped or printed on the Office action with the final rejection. See MPEP § 710.01(a). If the examiner, however, does not mail an advisory action until after the end of the 3-month period, the shortened statutory period will expire on the date the examiner mails the advisory action and any extension of time fee would be calculated from the mailing date of the advisory action. (F) Where a complete first reply to a final Office action has been filed within 2 months of the final Office action, an examiner’s amendment to place the application in condition for allowance may be made without the payment of extension fees even if the examiner’s amendment is made more than 3 months from the date of the final Office action. Note that an examiner’s amendment may not be made more than 6 months from the date of the final Office action, as the application would be abandoned at that point by operation of law. (G) Where a complete first reply to a final Office action has not been filed within 2 months of the final Office action, applicant’s authorization to make an amendment to place the application in condition for allowance must be made either within the 3 month shortened statutory period or within an extended period for reply that has been petitioned and paid for by applicant pursuant to 37 CFR 1.136(a). However, an examiner’s amendment correcting only formal matters which are identified for the first time after a reply is made to a final Office action would not require any extension fee, since the reply to the final Office action put the application in condition for allowance except for the correction of formal matters, the correction of which had not yet been required by the examiner. (H) An extension of time under 37 CFR 1.136(a) requires a petition for an extension and the appropriate fee provided for in 37 CFR 1.17. Where an extension of time is necessary to place an application in condition for allowance (e.g., when an examiner’s amendment is necessary after the shortened statutory period for reply has expired), applicant may file the required petition and fee or give authorization to the examiner to make the petition of record and charge a specified fee to a deposit account. Office employees may not accept oral (telephonic) instructions to complete the Credit Card Payment Form or otherwise charge a patent process fee (as opposed to information product or service fees) to a credit card. When authorization to make a petition for an extension of time of record is given to the examiner, the authorization must be given before the extended period expires. The authorization must be made of record in an examiner’s amendment by indicating the name of the person making the authorization, when the authorization was given, the deposit account number to be charged, the length of the extension requested and the amount of the fee to be charged to the deposit account. Form Paragraph 13.02.02 should be used. (I) Replies after final should be processed and considered promptly by all Office personnel. (J) Replies after final should not be considered by the examiner unless they are filed within the SSP or are accompanied by a petition for an extension of time and the appropriate fee (37 CFR 1.17 and 37 CFR 1.136(a) ). See also MPEP § 710.02(e). This requirement also applies to supplemental replies filed after the first reply. (K) Interviews may be conducted after the expiration of the shortened statutory period for reply to a final Office action but within the 6-month statutory period for reply without the payment of an extension fee. (L) Formal matters which are identified for the first time after a reply is made to a final Office action and which require action by applicant to correct may be required in an Ex parte Quayle action if the application is otherwise in condition for allowance. No extension fees would be required since the reply puts the application in condition for allowance except for the correction of formal matters — the correction of which had not yet been required by the examiner. (M) If prosecution is to be reopened after a final Office action has been replied to, the finality of the previous Office action should be withdrawn to avoid the issue of abandonment and the payment of extension fees. For example, if a new reference comes to the attention of the examiner which renders unpatentable a claim indicated to be allowable, the Office action should begin with a statement to the effect: "The finality of the Office action mailed is hereby withdrawn in view of the new ground of rejection set forth below." Form paragraph 7.42 could be used in addition to this statement. See MPEP § 706.07(d).